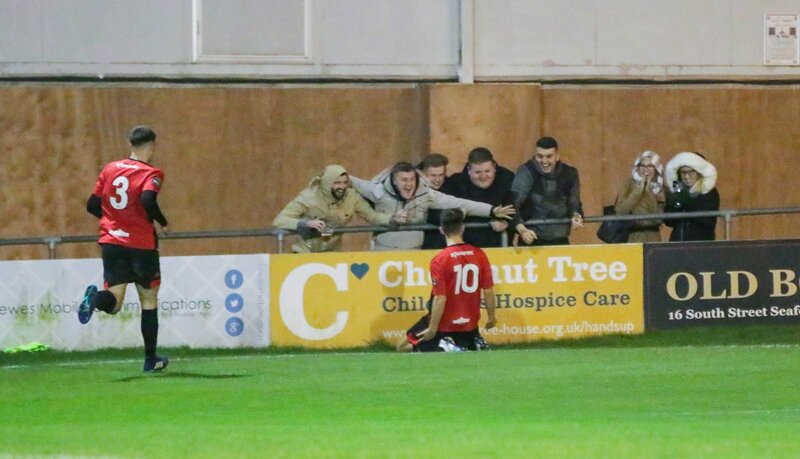 Goals from Michael Dome-Bemwin and Ronnie Conlon helped Lewes to a hard-fought 2-1 victory over Harlow Town at the Pan, a fourth consecutive league win which moves the Rooks up to third in the Bostik League Premier table, reports Tom Harper. Darren Freeman made three changes to the side that won 2-1 at Ashford Town (Middlesex) in the FA Trophy in their previous game, with Stacey Freeman, debutant Henri Wilder and James Hammond replacing Tom Day, Harry Reed and Declan Appau in the starting line-up. The Rooks were looking threatening every time they went forward early on, with Hayward gathering a long-range Lawson effort at the second attempt and Henri Wilder firing a dangerous cross-shot from the left just wide of the far post at the end of an incisive passing move. It was therefore against the run of play when the visitors equalised after 24 minutes through Tom Hitchcock, who sent a powerful half-volley from the edge of the area past the unsighted Lewis Carey and into the back of the net after being teed up by Matthew Foy. There were few chances of note for either side during the remainder of the half, with a Ronnie Conlon half-volley into the side-netting being the closest either side came to taking the lead. The Rooks started the second half brightly and regained their lead within three minutes of the restart, Conlon latching onto a Lawson through-ball and squeezing his effort under the dive of Hayward and into the bottom corner to put Lewes back in front. Lewes nearly doubled their lead just after the hour, as Hayward was called into action to push a powerful James Hammond free-kick onto the bar, with Stacey Freeman only able to guide his attempt on the rebound just wide. The Rooks were finding it difficult to create the chances they had during the early stages of the game, but were also restricting Harlow to very few clear-cut opportunities as they looked to hold onto their lead. Despite this, Carey was called into action twice in quick succession midway through the half, comfortably holding onto a long-range Nathan Twum-Koranteng strike, before needing to help an effort from substitute Mayowa Adaje over the bar just minutes later. Without playing at their best, Lewes saw out the closing stages relatively comfortably and should have made the game safe in the final few minutes, with Harry Reed seeing his close-range strike deflected just wide after more good work down the left by impressive debutant Wilder. This was another good win for Lewes, who defended well to hold onto their lead in a game of few clear-cut opportunities at the Pan. After the game Stuart Fuller spoke to Darren Freeman about the game and the performance. Next up for the Rooks is a trip to Corinthian Casuals FC to take on Kingstonian on Saturday, kick-off at 3pm. Lewes: Carey, Brinkhurst, Wilder, Dome-Bemwin (Appau 57), Chappell, Freeman, Darbyshire (Reed 80), Lawson, Smith (Elliott 72), Conlon, Hammond. Harlow Town: Hayward, Rodgers, Koranteng (Kissi 83), Cruz, Hastlings, Simms, Fox (Adaje 58), Yuill, Foy, Hitchcock, Aqcuah (Haabo 83).